It's not fair! While our pets enjoy natural whole-foods and herbal dietary supplements, we get served mislabeled fish in restaurants, and horse meat in ready-made beef products. We can't even enforce GMO-Labeling for food products made with genetically modified ingredients. 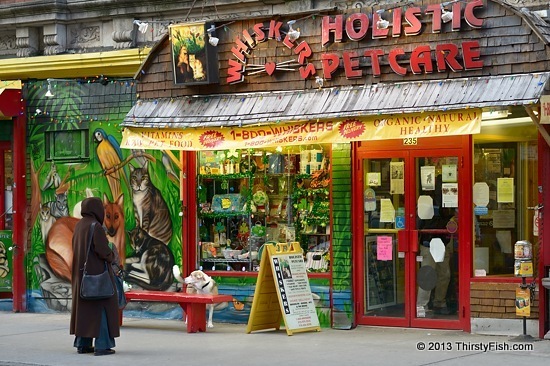 The pictured East Village store Whiskers Holistic Pet Care offers a variety of holistic products and advice for your pet. As a philosophy, holism, emphasizes the priority of a whole over its parts. It can be contrasted with reductionism which holds that a complex system is nothing but the sum of its parts. "Holistic medicine" has been used to describe a complete approach to healing, taking into account social, psychosomatic and somatopsychic factors. In theory it's reasonable that medicine simultaneously address the psychological, physical, social and spiritual needs of a human being. In practice this is not possible. Claims of holistic healing generally indicate exploitation by alternative medicine practitioners and even by some mainstream physicians. It is inherently impossible for a doctor to be qualified to guide patients in all - physical, social, psychological and spiritual - aspects of life. Human psychology is especially and inherently complicated. Even the most accomplished holistic healers operate in the realm of art, rather than science. And unfortunately, many "healers" are predisposed to 'making a lot of money'. Manufacturers of miracle drugs, foods, products, diets, exercises and techniques also add to the mishmash by deceiving both patients and healers. The marketing of psychotropic drugs by the pharmaceutical industry together with psychiatrists is a prime example of collusion. Does holistic medicine work? In short, no. Does a holistic lifestyle work? Only if you, yourself, figure out "who you are" and "how to live".